MARION — After wrapping up their respective regular seasons earlier on in the week, the bowling teams representing Galion High School were off and on their way to Cooper’s Bowl in Marion to compete in the Mid-Ohio Athletic Conference bowling tournament. The Tigers’ boys team, that went undefeated throughout the regular season until the last meeting of the season with Shelby, would see themselves finish as the runner-up squad in the standings while the Lady Tigers finished in sixth overall. Team scoring on the boys side went as follows: 1. Harding- 4,044; 2. GALION- 3,995; 3. Pleasant- 3,747; 4. River Valley- 3,650; 5. Buckeye Valley- 3,402 and 6. Shelby- 3,245. Austin Rinehart and Alan Evans would battle neck and neck to tack the top bowler honors for Galion on the day and it would be Rinehart edging Evans by just four pins. Rinehart rolled games of 204, 209 and 174, totalling 587 while Evans posted games of 212, 188 and 183, equaling 583. AJ Randolph used games of 192, 178 and 193 to record a three-game series of 563. Dylan Ruth would finish with a 522 (159, 202, 161) and Jacob Lear rounded out the scoring with a 468 (172, 140, 156). 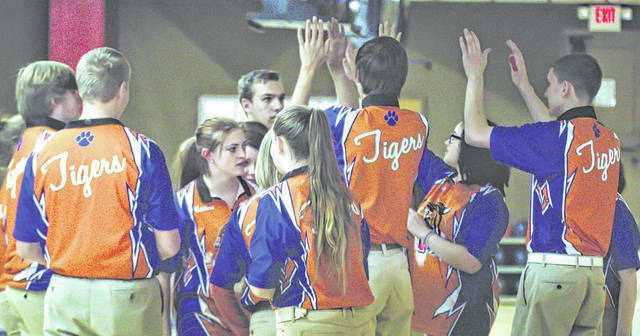 As a team, Galion rolled games of 939, 911 and 867 to head into the six-game Baker Series with a pin count of 2,717. In that Baker Series, the Tigers posted games of 214, 201. 189, 258, 226 and 190 to add on 1,278 for their grand total of 3,995. Over on the girls side of the alley, scoring went as follows: 1. Buckeye Valley- 3,264; 2. Harding- 3,207; 3. Pleasant- 2,892; 4. River Valley- 2,833; 5. Shelby- 2,500 and 6. GALION- 2,347. Halle Kiss would finish the tourney as the high roller for the Lady Tigers, recording games of 91, 123 and 158 to give her a three-game series total of 372. Shiyenne Current racked up a 360 series thanks to games of 124, 112 and 124. Abby Crager is the only other Galion bowler to participate in all three games and did so with scores of 113, 115 and 117 to give her a 345 series. Shalena Wilcox rolled in game one (120) and two (87) while Maleah Stratton took on game one (92) and game three (152). Paige Donahue covered the open spot in game two and posted a 101 score with Neavia Cansler stepped in in game three and finished with a 121. The Lady Tigers rolled a 540 before dropping to a 538 in game two. However, in game three, Galion posted a 672 to give them a 1,750 headed into the Baker games. In those games, the orange, blue and white notched scores of 111, 117, 145, 102, 106 and a 137 to add 718 more. Galion racked up 2,468 but it would not be enough in the deep, MOAC field.